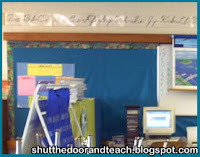 After reading this post from Schoolgirl Style I decided it was time to update my classroom decor. Don't get me wrong, I love my color scheme! 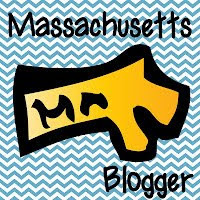 It's the same as I have for my blog (teal, aqua, lime green, and brown) and it coordinates with a lot of the existing colors of the furniture and built-ins in the room. No, what this post got me thinking about was the idea of consistency. I wasn't going to change my palette; I needed to bring more consistency to my classroom decor. And that meant changing out my bulletin board borders. As much as I like my Trend rainbow swirly star borders, I've had them since my second year at this school. My rainforest border and planet borders have followed me from my previous school...and before that, when I taught preschool. 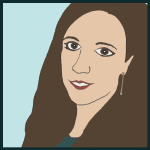 I felt I was justified in my decision to splurge in the name of change! Before I show you the end result, I wanted to talk about the issues and process of mounting my borders. See I don't just use them on normal bulletin borders; I have them covering two different problem areas. 1. The front and back of my classroom is a weird mix of whiteboards mounted on top of chalkboards and framed by thin panels of cork boards. This may work for some teachers, but I decided early on to hide everything but the whiteboards under shower curtains instead of butcher paper. This way I don't have to change it out every year. It's worked well so far! 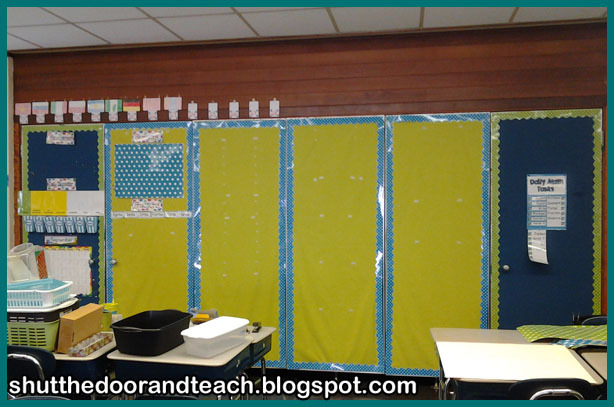 I just have to tape in the chalkboard spots and staple in the cork board spots. 2. I have 6 closet doors that I use as bulletin boards. 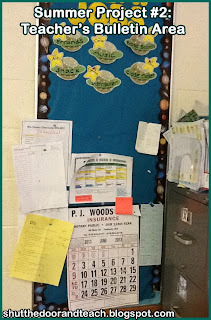 Three of them are actual bulletin board, and the other 3 are more chalkboards. Once again I covered them all, this time with fabric. Not only does it resist fading like the shower curtains, the fabric also helps to dampen the sound in the room a little. I've also found that my borders really last a long time if I laminate them. Before I did that they'd get shredded and fall off with use (kids opening and closing the closet doors every day). In the past I used Velcro to adhere the fabric to the chalkboards and then stapled the border to the fabric. It works pretty well! There is some sagging, so I've had to replace the Velcro in places, but it's not a bad system. However, since I splurged on all new borders, I decided to try a new approach. My idea was to use those tiny Command hooks at the top only. This way they'd hold the weight of the laminated border and fabric, and the Velcro left on the sides would be more to prevent it from swinging than holding it up. 1. After taking down the old stuff and cleaning the area where the hooks would hang, I stuck one hook in each corner and two in the middle. 2. I carefully hole punched the fabric so it could hang on the hooks. Take your time to line up the hook with the area you hole punch! It helped to have sticky spots to hold the fabric in place during this process, so if you're starting with a clean slate either enlist a partner's help or tape it temporarily. 3. Create frames out of your border. 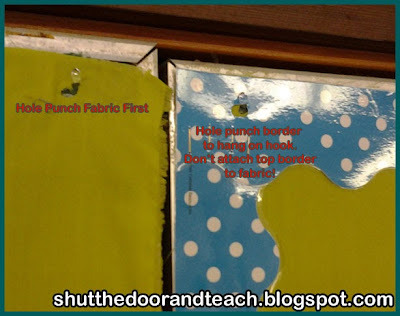 You're NOT attaching the border to the wall or fabric in this step. 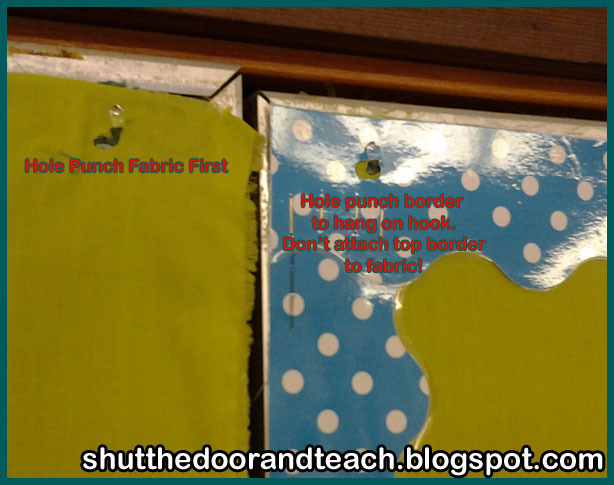 To do this, hold the border up to the top and trim it to the size you need (if you make 2 for each door, use one for the top and one for the bottom. Put the bottom aside to save for the final step). Then, staple the sides to the perfectly measured border. I needed just over 2 strips to equal the height of the door. Of course you want to overlap the strips to staple the ends together (line them up for a continuous ripple pattern). 4. 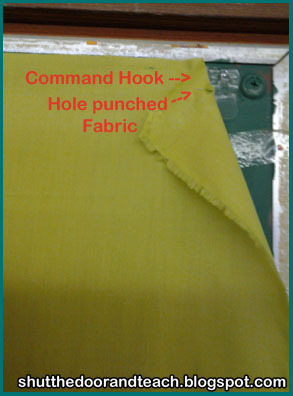 Hole punch the top of this border frame the same way as you did the fabric, starting from the hook in one corner. DO NOT staple the top of the border to the fabric. If you do, you have more of a chance that the border or the fabric will pucker. Just let the hook hold things up and gravity straighten things out below. 5. Start stapling this unfinished border frame to the fabric. Again, at this point gravity should have straightened the sides out for you. As long as your sides are perpendicular with the top of your frame, this step should be easy (if not, you can detach and re-attach the sides from the top). 6. Finish up your frame by stapling on the bottom of the fabric. Although I felt a little sad when I took down the old stars (more so than the Jungle and planets borders) I'm very pleased with how my doors look now! They flow not just with each other, but with the whole room. I can't wait to be finished with the cleaning and organizing so I can see how it all looks together! It's already looking a lot more cohesive and calming. I'll have more pictures of the rest of the room up hopefully at the end of the month, and as the year goes on I'll try to remember to update you on how the Command hooks "hold up." 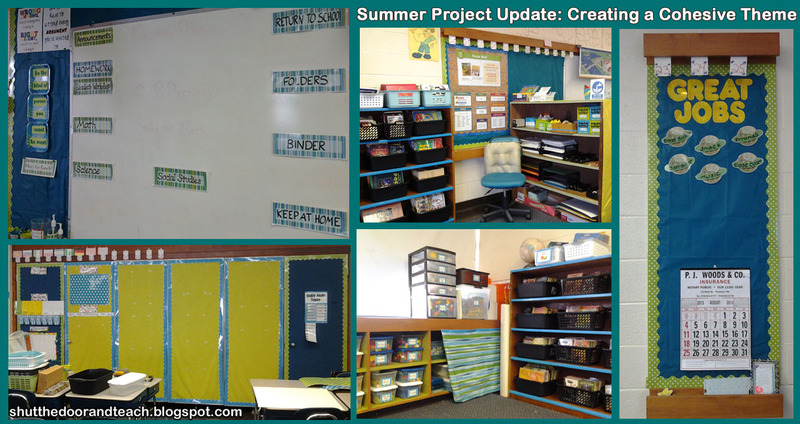 I've already made headway with several of the other projects in my summer series, (as you can see above the Teacher's Bulletin Area is pretty much set) which I'll post next week. Sadly, once that's done it's on to filing paperwork, which is sadly more like ACTUAL work! At least being in an updated, pretty room will help me feel renewed. That and hitting the beach once the building shuts each afternoon for as long as the sun will let me! If you're still on vacation, I hope you're finding a good balance between preparing and relaxing. Also, I'm linking up with Swimming Into Second for her Show Off Your Space linky! If you love to check out classroom design there are some great ideas here.